We now have a new agent in Canada that we have teamed up with. They are a long standing company and held in high regard in the Canadian freight forwarding world. This now means that we can extend our services in Canada to cover the whole of Canada and we can now ship or air freight any cargo, be it a single box, a vehicle or a whole container. Having this new agent on board means that between them and us, your cargo is not only in safe hands from collection to delivery, but you can assured that all the paperwork will be correct on both sides of the ocean. If you have cargo ready to be shipped or you are only thinking about shipping or relocating to Canada, call us on 01246 451231 to discuss it. You will pleasantly pleased by our friendly and knowledgeable staff who will listen and guide you on the right road to a successful shipment. We are experts when it comes to shipping to Walvis Bay, the shipping line recognise this and that is why we can offer these great rates. Please do give us a call to discuss these rates as we can offer services from various locations across the UK but the rate may differ from the above. We are pleased to announce that we have now got a fantastic agent in Walvis Bay who we are working closely alongside with to assist our customers with clearance of vehicles and movement of vehicles into Zimbabwe. We can arrange this through to Plumtree Border or Kazangula Border post and we have an agent based in the port area of Walvis Bay and she assists with all the paperwork and transportation up to the border posts which takes all the hassle and time driving from Walvis Bay to Zimbabwe. We also ship to Durban and have an agent based in Durban who again can assist with the onward movement to Beitbridge. Call us now and speak to Kerry who is our specialist in these areas. If you want a friendly but professional service then we are the company for you. We have been in the business for years and know what we are talking about. Call us now for advice! We have a fantastic agent in Hong Kong who we are able to arrange for vehicles to be loaded and secured into containers and shipped back to the uk. They also assist with export paperwork and clearance and to make everything hassle free for you. We can also arrange for vehicles to be picked up in Hong Kong!! Once the container arrives here we take over and deal with all import paperwork, make arrangements for containers to be picked up and unloaded. We can then either hand the vehicle over to you at the point of unload or arrange delivery through to your door. All hassle free, for you. 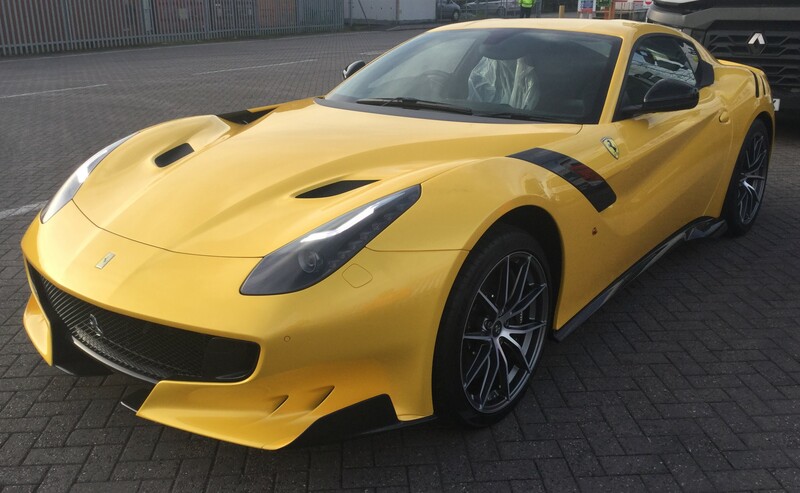 We were entrusted to arrange load and delivery of a beautiful Ferrari, from point of pick up in Hong Kong right through to the offload of the car here in the UK. We are the experts who have the knowledge , expertise and connections to get the job done efficiently! Below is a photo of the vehicle just after we unloaded it. We are excited to announce with have now got a great agent to deal with in Limassol. We can now offer our customer assistance with imports into Cyprus and exports coming from Cyprus. Having contacts and knowing the right people is key to successful shipping. We have some great rates for containers so contact us today!